Many homes have interesting histories and connections. I recall meeting Jewish professional baseball player Ryan Braun, the Milwaukee Brewers All-Star, who told me that his grandfather's house once belonged to Jewish Hall-of-Famer Hank Greenberg (Braun lived in that house for a time during his youth). Now, the father of my former camper at Camp Ramah in Wisconsin, Henry Bernstein, has co-written an article about the interesting history and Jewish connections of Barack Obama's house in Chicago. 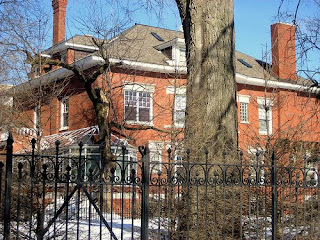 Charles Bernstein, genealogist of the Chicago Jewish community and a founder of the Chicago Jewish Historical Society, writes in the Chicago Jewish News that the construction of the Obama home was financed by a prominent Chicago Jew, was once lived in by a Jewish family, and was home to both a Jewish day school and a yeshiva. President-Elect Barack Obama's house, located on the South Side of Chicago at 5046 South Greenwood Avenue, is located across the street from the Reform KAM-Isaiah Israel Congregation, Chicago's oldest Jewish congregation. In fact, Secret Service agents who guard the Obama home enter the Reform temple to use the restrooms. The article adds that KAM-Isaiah Israel Congregation members must identify themselves to Secret Service agents who verify them as Temple members. The Hebrew Theological College (HTC), now located in Skokie, Illinois, had a branch located at the Obama home. "HTC, known colloquially as 'the Yeshiva,' wanted to establish a South Side base to service [the] Orthodox community. A Milwaukee philanthropist, Anna Sarah Katz, donated $50,000 to HTC, which enabled it to purchase the 5046 Greenwood property. It obtained title from the First National Bank of Chicago, which had acquired the property by taking over the Foreman bank when it went bankrupt during the Depression... Hyde Park's Orthodox population began to dwindle in the early 1950s, and in 1954, the Yeshiva sold the property to the Hyde Park Lutheran Church by a deed signed May 21, 1954. The purchase price was $35,000, based on the revenue stamps of $38.50 affixed to the deed. The deed was signed by Rabbi Fasman, who was still president, and Samuel T. Cohen, secretary"
So, the Obama family will be moving from one home with a rich history to a new home with a very rich history.